On Wednesday I had a great visit to Chicago, for Adaptive Path's UX Intensive Interactive Design Workshop in Chicago's Old Town. I'm currently scanning in my sketch-notes from the event (which I will post tomorrow), but in the meantime I wanted to post a sketchtoon from my dinner in the evening. I had the pleasure of traveling to Chicago with my friend Hyeon "Sean" Kim on the Amtrak Hiawatha to UX Intensive. After the event, I met Sean on the Brown line EL train at Sedgwick to Rockwell station to visit a Korean restaurant on the North side of town. Sean had a Korean restaurant in mind, but after walking to Lawrence Avenue and searching, we realized it had closed or moved, because a new condo was sitting right at the corner where it should have been. It was actually good fortune for us to walk the neighborhood, since we came across Han Bat, a small, family-run Korean Soup restaurant, right on Lawrence Avenue. The sketchtoon was created in my Moleskine sketchbook, while riding home on the EL. Sean and I contentedly recalled the details of our delicious Korean dinner. I colored this piece later on, to add just a little more detail. Now I can't wait to try more Korean foods! Long time no hear from me.I had your blog on my AvantGo, but did not took the time to come online. Now I just took the quick time to check in an let you know, that I love your SketchToons coming back. :-)Thanks for sharing them. They are great and inspiring as usual. I really like your style..and your sketches are so full of life..really nice! 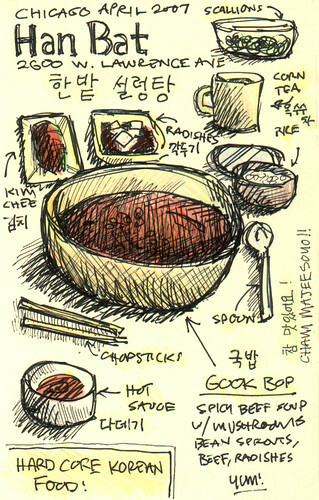 may i join the next korean lunch or dinner? ;)love your sketch. Sara, thanks for your kind words! Mike: I really like this concept. I am going to have to give it a shot as it combines a lot of things that I enjoy doing. I assume it is most effective when you are trying to note ideas, thoughts, big pix stuff rather than details. Do you find that you trade off details for speed? As always, love your blog.....keep it up!! Thanks! I think this approach works best for capturing general themes, though it cvould work for details -- you'd probably have to limit the drawings and embelleshments to keep up with details.